Two rounds of fierce competition have made the players glisten with effort and anxious to take it all home. In my imagination anyway. In real life, they almost certainly don’t know they’re even in the NLC’s Hottest Baller tournament, but that’s OK. My imagination is very good. Jason LaRue, backing up the plate in St. Louis, may not be the top catcher these days, but he’s still the hottest backstop in town. He took down Rick Ankiel in the second round to advance to the semifinals. 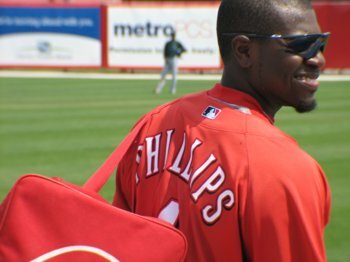 Brandon Phillips, enjoying a long-term contract in the Queen City has the moves to go with the smile. He’s already hot this spring, and not just on the field. Posted in Brandon Phillips, Cincinnati Reds, For the Ladies, Jason LaRue, St. Louis Cardinals. Welcome to round 2 of the Jason Romano Commemorative NLCâ€™s hottest baller contest. 15 of the best-looking players on NLC (plus one fella in limbo) face off in a single-elimination tournament. The first match in our second round features two players from the town of Budweiser. Recent Cardinal Jason LaRue took down Brewers prospect Manny Parra to make it to this second round. 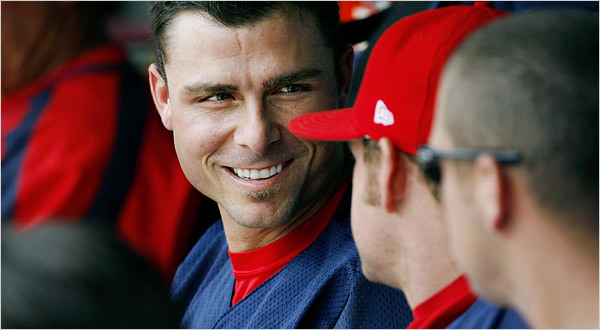 Always Cardinal Rick Ankiel survived Cubs prospect Sam Fuld and illegal substance allegations to make it to this round. Posted in Cincinnati Reds, For the Ladies, Jason LaRue, NL Central, St. Louis Cardinals. Welcome to round 1 of the Jason Romano Commemorative NLC’s hottest blogger contest. 15 of the best-looking players on NLC (plus one fella in limbo) face off in a single-elimination tournament. Special thanks to the literally one of your who nominated players. Don’t see your favorite on the list? Well, I hope you’ve learned the benefits of nominating someone. The rest of the players were selected via a complex scientific process of looking at their profile photos on their teams’ MLB pages and, in some cases, me just adding them. They were then quasi-randomized and bracketed for this exciting, once-in-a-lifetime contest opportunity! You’ll have 1 week to place your vote in each contest. New contests will be available as I get around to them. Feel free to pimp for your favorite in the comments. Results are final and cheating is OK as the contest doesn’t really mean anything. Our first pairing pits a longtime Red Hot Mama favorite, the Cardinals’ Jason LaRue, against an unknown in the Brewers’ Manny Parra. LaRue boasts the square jaw, rugged features, and constant damp skin of the hometown boy all the country girls swoon over. Parra brings a subtle sweet smile and boyish charm. And though you’ve never heard of him, that’s only because he just debuted in July. In his 26.1 innings pitched, though, he brought a 3.76 ERA and 26 Ks. 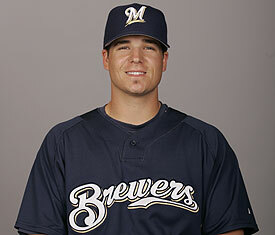 Posted in For the Ladies, Jason LaRue, Milwaukee Brewers, St. Louis Cardinals. 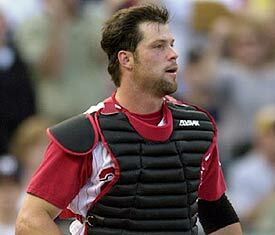 According to a baseball source, the Reds are on the verge of trading catcher Jason LaRue to the Kansas City Royals. The Reds will receive a player to be named later. No cash involved in the deal. Later, we found out that the Reds did actually send a mystery amount of cash along with LaRue. Even though he fell out of favor with some of the more fickle fan base, a whole lot of people always liked him. We at RHM wish LaRue the best of luck and will be watching his progress with the Royals with much interest.